Home ♦ Dining ♦ Are you hungry enough to take on these Vegas food challenges? Are you hungry enough to take on these Vegas food challenges? If you ever watch “Man v. Food” and think, “Hey, I could do that,” then we have just the thing for you. Las Vegas is home to quite a few crazy food challenges. From burgers to burritos, we’ve got monster-sized meals and if you can finish them – usually within a short amount of time – you’ll get the glory. And maybe even a prize. If you think you’re up for it, come hungry and wear your stretchy pants. Here are some of the biggest food challenges in Vegas. Du-Par’s, which has been at the Golden Gate since 1955, is famous for its pancakes. In fact, they were named the “Best Pancakes in America” by Esquire Magazine. If you agree with Esquire and want to eat a whole bunch of them, you can take the Stackzilla Challenge. 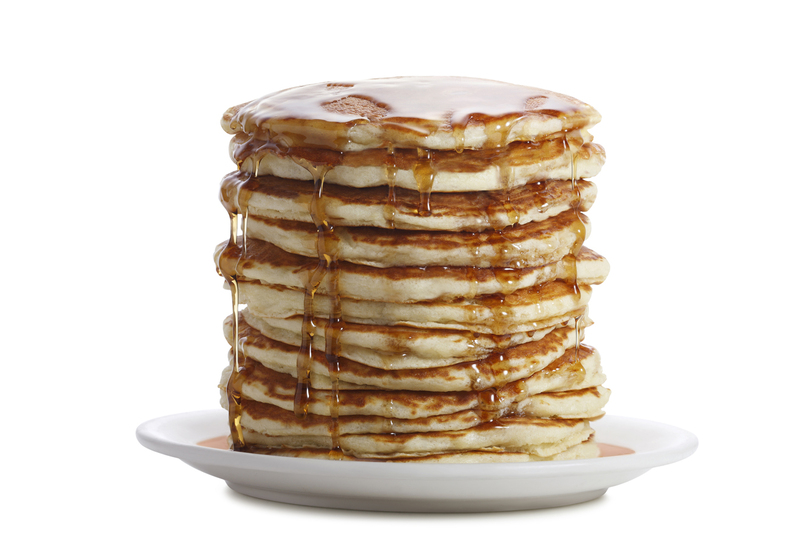 Down the stack of 10 pancakes in 15 minutes and they’re free (normally $16.99). You’ll also get a free Stackzilla T-shirt so you can prove to all your friends that you conquered it. Fame or shame. It all comes down to whether or not you can down 24 sliders in 24 minutes. If you fail, you’ll owe $40 and have your picture posted on the wall of shame. Succeed and you’ll get a free meal and a spot on the wall of fame. Think you’ve got what it takes to eat a massive burger meal? Then cowboy up and take this challenge. The price to enter is $99, but all you have to do is finish it within 30 minutes and it’ll be free. Sounds easy, right? Not so fast. 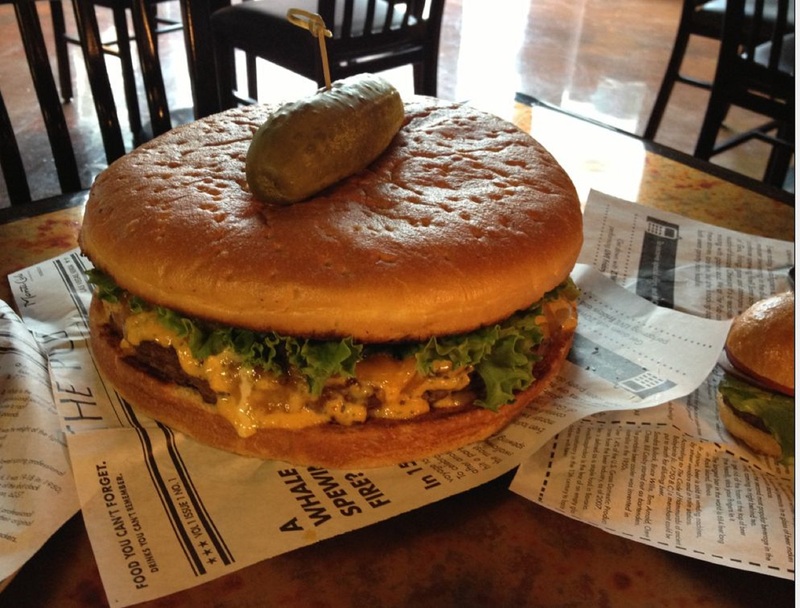 The challenge features a two-pound beef burger, topped with a half pound of cheddar cheese, a half-pound hot dog and a half pound of PBR’s house-made chili, all atop a giant burger bun. 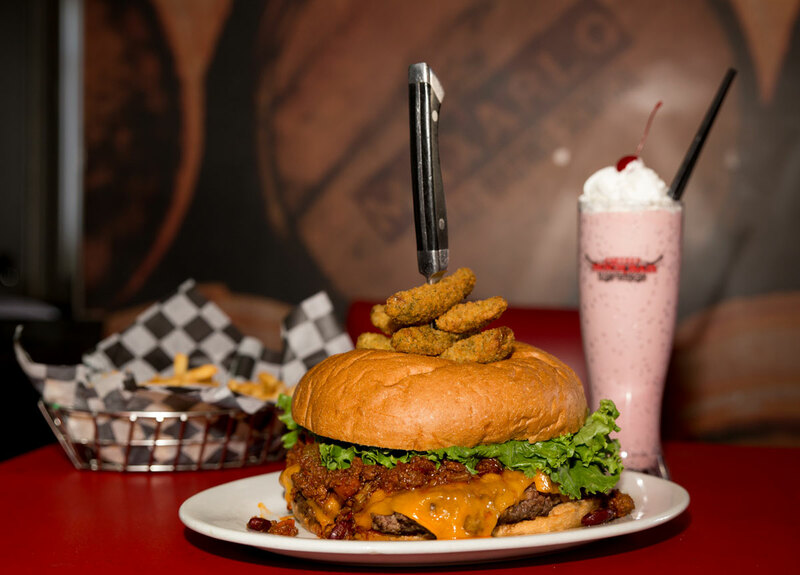 The burger is topped with four fried pickles and accompanied by a pound of french fries and a 24-ounce milkshake. If you succeed you’ll also get $50 in PBR Bucks, a free PBR T-shirt and $25 each to PBR’s sister shops Rockhouse Las Vegas and Chayo Mexican Kitchen + Tequila Bar. This challenge sounds kind of scary but if you like things hot and spicy, give it a try. You’ll have to down 20 wings in 20 minutes. The catch is that the wings are soaked in Diablo’s Death Sauce, a super spicy blend of habanero chili purée and ghost chili extract. If you do it you’ll get a free T-shirt and a picture on the restaurant’s wall of fame. Like burritos? How about a 4.5-pound burrito? 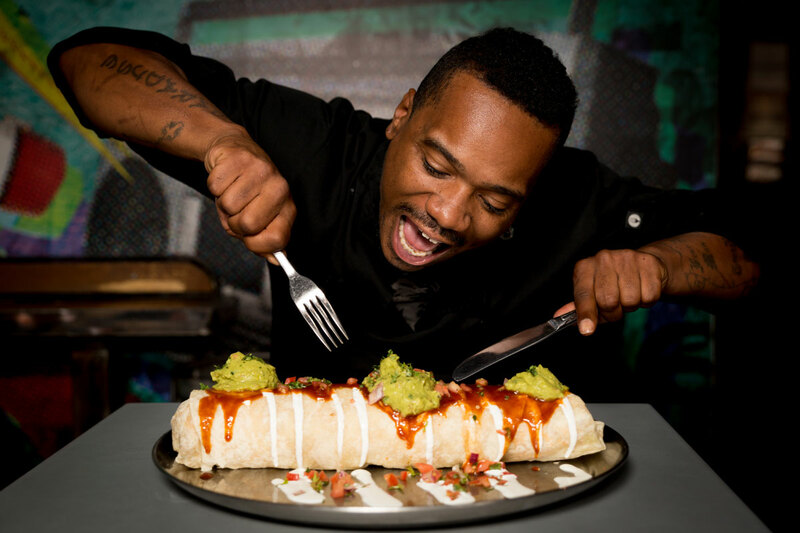 The challenge burrito is made of carne asada steak, pico de gallo, sautéed onion, green chilis, cheddar cheese, french fries and lettuce, wrapped up in three 12-inch flour tortillas, all topped with sour cream and – you guessed it – guacamole. Go big or go home, right? The cost to participate is $45, but if you can down it in 20 minutes or less, it’ll be free. Champions of this challenge will also earn $50 in Rockhouse bucks, $25 to PBR Rock Bar & Grill and Chayo Mexican Kitchen + Tequila Bar, plus a free Rockhouse T-shirt. This one is for the carnivores. You might have seen this challenge on Food Network’s Outrageous Foods. And outrageous it is. 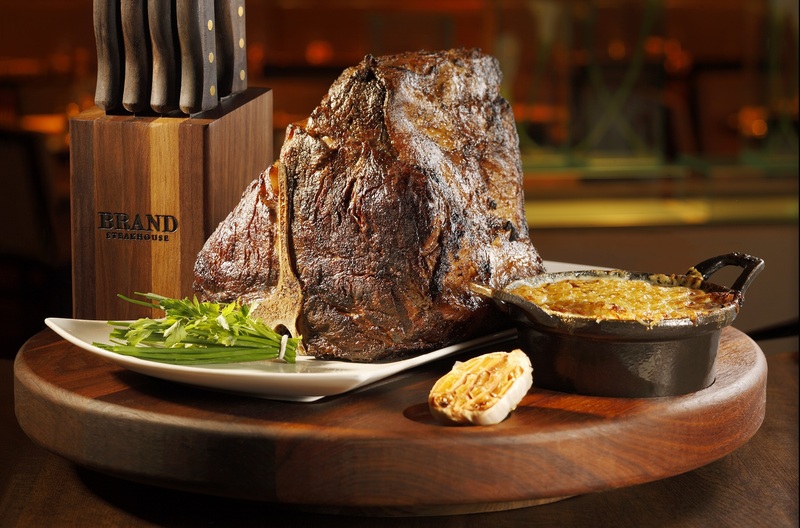 Meat-lovers must eat a bacon-wrapped, 120-ounce porterhouse steak in one hour or less. In case you’re wondering, that works out to 7.5 pounds of beef. If you succeed, it’s free. If not, you’re looking at a $250 tab. Warning: Not too many people succeed at this one. Challengers have 45 minutes to eat an eight-pound hamburger with 10 slices of cheese, lettuce, tomatoes, jalapeños and caramelized onions. Oh, and you also need to wash it down with a 32-ounce beer or root beer. Those who are able to finish win a free T-shirt. 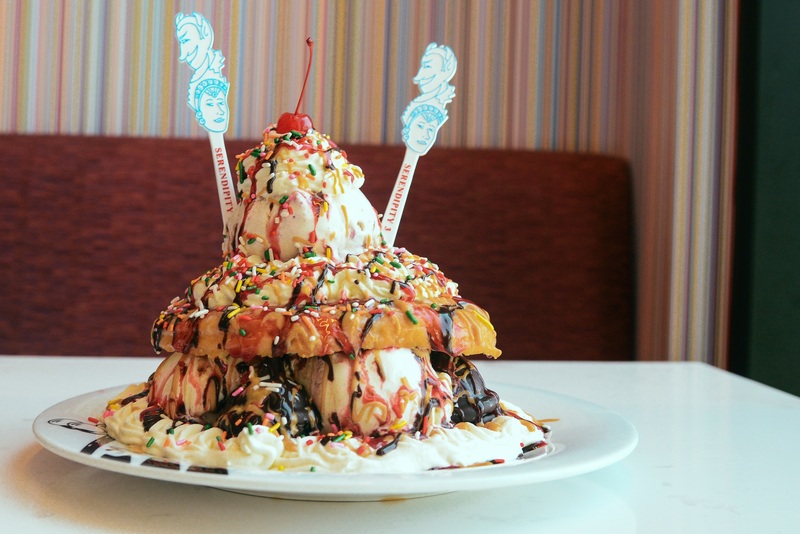 We all scream for ice cream, but it might be your stomach that’s screaming after this challenge. You have to eat a Peanut Butter & Jelly Glazed Donut Ice Cream Sundae within 10 minutes and without help from your buddies in order to get it for free. The sundae has three pints of vanilla and strawberry ice cream, one 10-inch glazed donut, Oreo kisses, chocolate sauce, peanut butter sauce, raspberry sauce, whipped cream and a cherry on top. OK, beer’s not technically a food (well maybe it is for some of you) but we still wanted to mention this challenge. If you gulp down a pint of beer in seven seconds or less, it’s free. Servers will be watching you and timing you with hourglass timers. So, what do you say? Do you think you have what it takes to conquer any of these food challenges? If so, we commend you. Or, you can always create your own adventure at any of these Vegas restaurants.